Peyton Manning, fitting into the routine of the Peyton Manning archetype, had himself a great regular season — a beyond great regular season, if we’re being honest – and then proceeded to get trounced, badly, in the 2014 Super Bowl. Manning, no stranger to television even in his downtime, appeared on the Late Show with David Letterman on Monday night to talk about things. Football things. 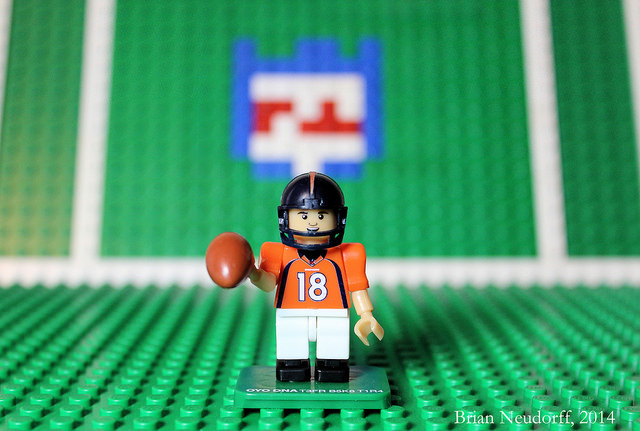 There is a popular theory that Manning is secretly a biogenetic machine designed to live, eat, and breathe football. Regrettably, Letterman did not address that in his sit-down. The future Hall of Famer continued, saying that while doctors and other surgery recipients had prepared him for the unpredictable nature of recovery and that he might wake up one day and feel better than he had in years, that day hadn’t shown up yet. “Today’s not the day,” Manning said to Letterman, describing the inevitable daily disappointment. He also described the differences in his game from the outset of his career, saying that he was more cerebral with his play now that he couldn’t make the throws he could in his youth. The quarterback, whose sense of humor has been quietly understated throughout his career, quickly offered a solution. “You just gotta get up there and say some really negative things about the commissioner, Roger Goodell. Blue-20, Blue-20, Roger Goodell is a no good you-know-what, and they’ll just turn the volume right down.” Letterman pointed out that Belichick used his own microphones, but Manning didn’t rise to the SpyBait. And, no, Peton hasn’t thought seriously about retiring, but if the Broncos say it’s time, he’ll probably go with it. Because he’s Peyton Manning — always amicable.